The user-friendly Brother PT-7100VP handheld label printer is ideal for professional trade. This model delivers professional labels that can be used for labelling cables and network components and even for creating warning signs. The labeller itself is portable enough, but with the convenient hand carry case, it’s even easier to bring to project sites. This model delivers long-lasting and durable Brother PT7100VP printed labels that are resistant to chemicals, fading, temperature and abrasion. With orange and black housing, the Brother PT7100VP portable label printer weighs 363g and measures 30.7 x 30.4 x 11.2 cm. It's integrated with a manual cutter and has a 12 characters x 1 line LCD. An ANC keypad with separate numeric keypad is also on the Brother PT-7100VP. The P-Touch 7100VP printer can use durable Brother TZ label tapes that come in a variety of colour combinations with sizes ranging between 3. 6, 9, and 12mm (x 8m). It has cassette and battery compartments at the back and a jack for an AC adapter on top. Thanks to the packaged handy carry case and AC adapter, the Brother PT 7100VP P-Touch labelling system can be easily taken to project sites and stored. This model offers different options for labelling with its 6 frames, different character sizes, over 200 characters, and sequential numbering. The Brother P-Touch 7100VP labeller can print up to 2 lines and up to 80 characters on a single label. Its memory can save up to 9 locations or 720 characters. Mirror and vertical printing are offered. The Brother PT-7100VP label machine could be better if it offered more than one font. 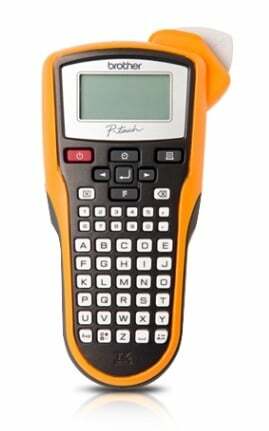 The PT7100VP labeller also lacks a back-lit display for use in areas with poor lighting.